It was a nice run by Mississippi State to stay undefeated for most of the College Football season, but then came Alabama and brought things back to normality and the recognized in the SEC West, which means a big change at the top of the rankings and what the playoff picture currently looks like, especially with Florida State conjuring another big escape to remain one of the two undefeated teams along with the irrelevant Marshall. The picture in the SEC West just got a lot clearer with the Alabama win. It puts the Crimson Tide and the Bulldogs at one loss each, leaving behind Ole Miss (with two losses) and Auburn with three losses after falling again, this time against Georgia and the running power of Todd Gurley and Nick Chubb. Both teams still have to play their state rivals: Alabama at home against the fading Auburn, Mississippi State at Ole Miss in an Egg Bowl that suddenly isn’t as big as it could have been. Mississippi State also have a game against Vanderbilt while Alabama play Western Carolina next. The SEC East remains in Missouri’s hands. They’ve lost just one game and after their win at College Station over the unexpected Texas A&M, they’ll surely be ranked. Their schedule hasn’t been an impressive piece of work and their only game against a serious team, Georgia, ended in a shutout loss, but they’ve done very well with what was given to them. Georgia, the better and more impressive team, have two losses, and they’ll need Missouri to slip up at Tennessee or at home against Arkansas. The latter seems like the trickier option. 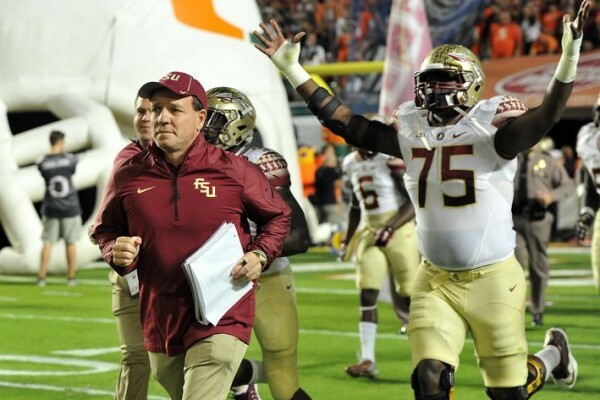 In the ACC, Florida State kept on winning while coming from behind, this time with a late touchdown against Miami. It means they’re 10-0 overall and 7-0 in the conference. With Clemson losing to Georgia Tech, it’s all over in terms of trying to somehow catch up with the Seminoles, who need to avoid a loss in their next three games (Boston College, Florida and ACC title game) in order to make the College Football playoff as the only undefeated team there. The ACC Coastal becomes very interesting after Duke loses to Virginia Tech. Georgia Tech will probably win the division even if Duke win their next two games (North Carolina and Wake Forest), unless their loss to Georgia in the ‘hate’ game is a bit too hard to endure. Miami and North Carolina are out of the picture, and whoever goes to meet Florida State will be a massive underdog, as it has been for the last couple of years. The Big 12 hasn’t changed: TCU won, Baylor and Kansas State didn’t play. In the Big Ten, Ohio State need to go through home games against Indiana and Michigan unscathed and they’ll be in the conference championship game. Against who? They took out Minnesota with their win, with Wisconsin leaving Nebraska in the dust after the record breaking day from Melvin Gordon. Iowa are still in it with a win over Illinois, but it’s Wisconsin’s spot to lose, with games against Iowa on the road and Minnesota at home left to play. The Pac-12 has one division causing all the trouble, taking all the interest. The North is won by Oregon, so there’s no need to dive deeper into the failure of Stanford or any other team to put an above .500 record in the conference. We now have four teams with two losses in the South division: USC, at 6-2, following a win over California; They have one game left, away at UCLA. The Bruins, resting this week, with USC and Stanford still on the cards; Arizona, following a win over Washington, with an away game at Utah and then the Desert duel vs Arizona State to go through; and the Sun Devils, losing at Oregon State, which means no playoff, but maybe also no championship game in the conference as well. Utah, with three losses, still have a chance, but a very small window.